I know that Pimpbike has a decent undertail, but I was thinking of doing my own. 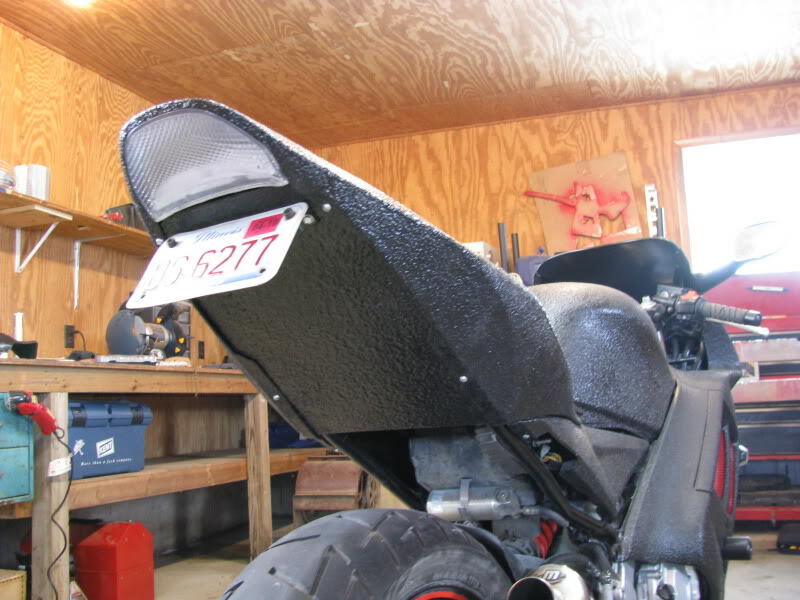 Either aluminum sheet or fiberglass, I'm undecided, anyone else tackle a do it yoursel undertail that has any inspiration for me? funny, ive started to do the same thing to my 98 F3 today. i recently removed the stock tire hugger/chainguard and now see the need for a simple undertail to keep my bits clean. today ive fabricated a simple cardboard template that slips right up in the tail section. next will be to find a more rigid material (sheet metal?) and cut it to shape then decided how i will be mounting it. i am thinking about mounting it to the bottom of the tray in the back so i can still removed my rear sides without it being attached. heres a crappy picture i took of the template on my bike. the second one is the same thing but painted black so i could get a better idea of what it will do. also debating wether or not to keep my current mounting for my license plate, or make the undertail go all the way to the end and then make a new bracket attached to the undertail for the license plate. Last edited by andyriot; 04-01-2010 at 09:45 PM. How are both your undertrays comming along? well i just got in from fabricating my undertail out of aluminum. i traced my template onto it, cut it out, then proceeded to bend up the edges and test fit it multiple times. then i drilled some mounting points on the undertray and matched them to the undertail. many bends and test fits later, i am now waiting on the first coat of herculiner to dry on it it looks great and i cant wait to get it back on the bike! !